This album from 1968 at that time was Number 1 on Decca’s “Top Selling Album List”. Bert Kaempfert sought out well known songs for his recordings and virtually made them his own. Himself a writer of numerous hits, he always treated the original works of his composer colleagues with great respect: his arrangements left the basic melody unchanged, while his special sound lent the work new lustre. A good example of this is offered by Duke Ellington’s classical jazz composition Caravan from 1937 with its unforgettable melody. The exotic timbre, bass guitar played over a “fuzz box” and growl effects of the trumpet, all of which relate directly to Ellington’s “jungle style”, sent this Kaempfert single (Decca DL 32241) to the top of the US hit parade in 1968. Another classic, The Sheik Of Araby, was inspired by the silent movie “The Sheik” (1921) filmed with Rudolph Valentino, the romantic idol of the Twenties. In his recording, Bert Kaempfert lends the oldie a modern tone coloring. Axel Stordahl, Paul Weston and Sammy Cahn combined their talents for the film musical “Thrill Of Romance” (1945) and came up with the song I Should Care, which was to become a best-seller for Frank Sinatra. Bert Kaempfert breathes new life into this old favorite, just as he did with the solemn number Again from the film “Roadhouse” (1948), which took its place in the repertory of stars such as Vic Damone, Doris Day, Mel Tormé and Tommy Dorsey, and with Billy Hill’s The Glory Of Love from 1936, which achieved new popularity in 1967 thanks to the film “Guess Who’s Coming To Dinner” with Spencer Tracy, Katharine Hepburn and Sidney Poitier. Country music is also represented by one song which managed to get a foothold in the pop sector: Just As Much As Ever was a Top Forty hit for Bob Beckham. 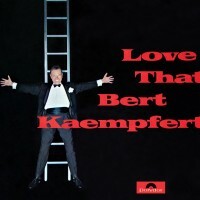 Bert Kaempfert crowns this compilation with several original compositions: The First Waltz is a lively waltz which gives prominence to the brass; Manfred Moch’s trumpet is heard to great effect in the delightful My Love For You and also in Steppin’ Pretty – a work which is sure to get you swinging; Lonely Is The Name, for its part, was an enormous success for Sammy Davis, Jr.